The two-level home has a very friendly and welcoming exterior. It is obviously a new construction, but the chunky brick columns, classic red roof tiles and peaked roof give it a timeless spirit. It's interesting to see that there is no garden or landscaping. But it still has a warm feel because the paving is made from natural stones that have lots of texture. Also, note how the surrounding porch is set quite deep under the eaves. This doesn't just give the occupants lots of shade it also adds some privacy. In the main living area we have a distinctive modern decor with just hints of rustic flair. But even in this modern living room there are some elements that serve to create a link with the rustic spirit of the home. 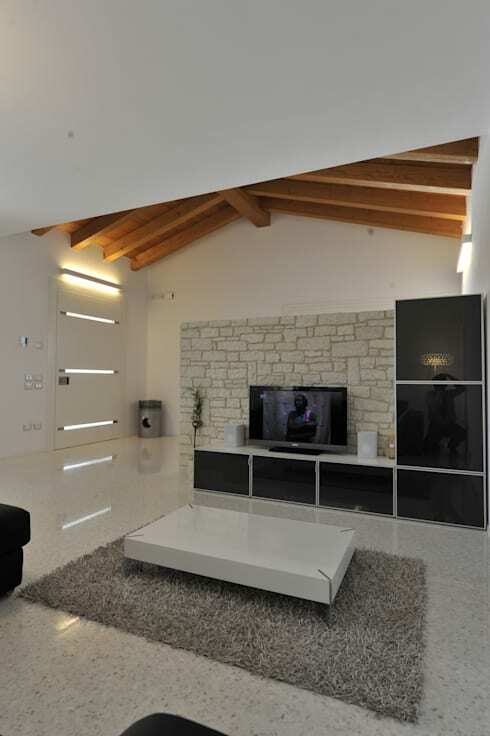 The floors are made from highly polished white stone, there is a lovely low brick dividing wall and a white colour scheme that unifies all the different elements. Let's have a closer look at that peaked roof. A peaked roof provides lots of opportunities for some interesting living spaces inside a home. This is doubly true in a home with two storeys. 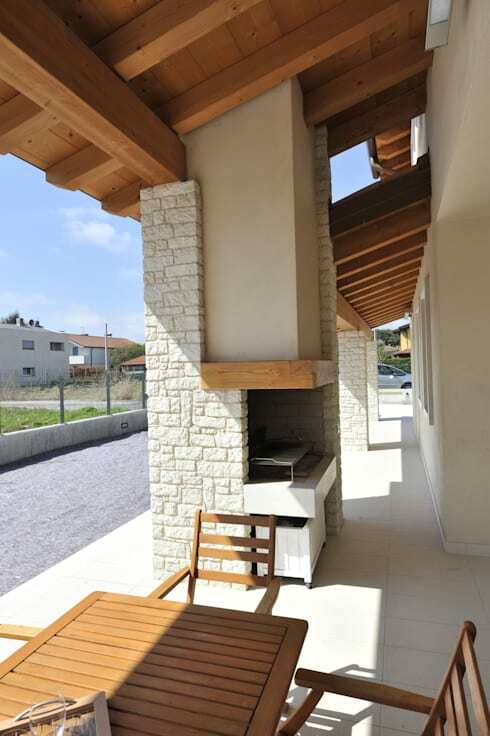 The exposed wooden ceiling beams we see here forms the roof of the ground level. The second level of the home is shorter in length and ends at the edge of the lowered ceiling in the foreground. This adds interest to the living spaces and forms a natural boundary between the various living areas. We will explore the modern kitchen later, but first, we will present the chunky wooden staircase with its soaring timber ceiling. 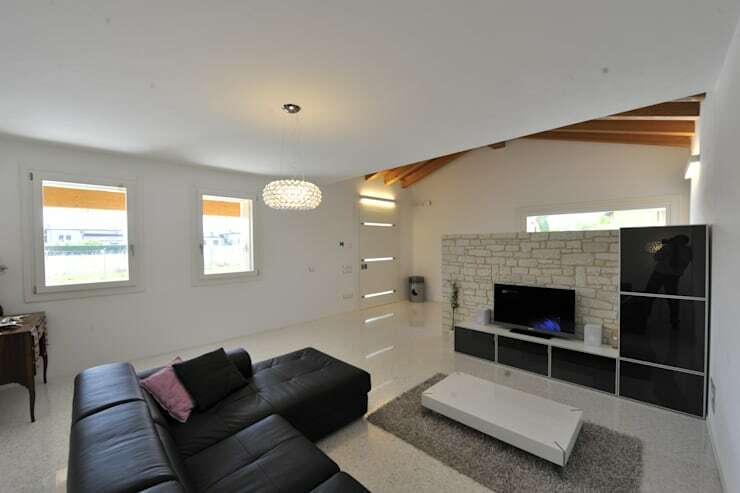 The materials, structure and solid workmanship are really the main focus in this kind of home. 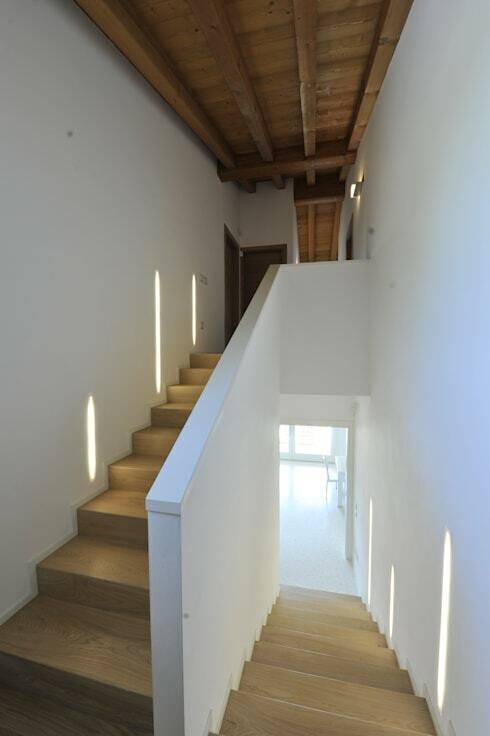 Here we can see how the banister is thick, white and simple. As usual, rustic interiors are best when kept simple and sturdy. The basic elements in this kind of decor are perfect for the bedrooms. 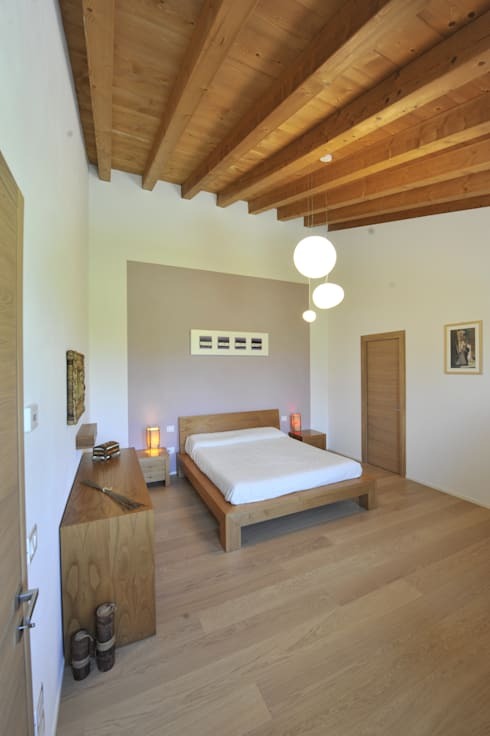 So the exposed timber ceiling beams, timber-floor and simple layout has been carried over to the bedroom without barely any amendments. Wooden bedroom furniture is an obvious must in this kind of home. 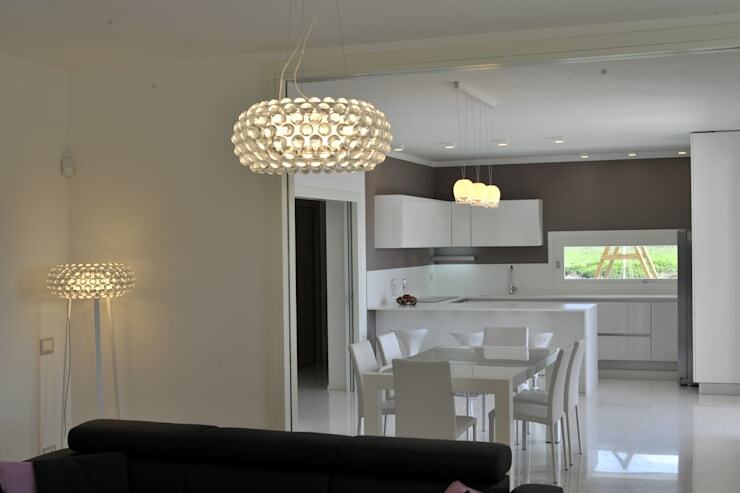 The organic pendant lights are a nice touch and add a certain sense of lightness to the earthy room. The kitchen, however, is the one room where many lovers of rustic style homes favour a more modern approach. This kitchen is unapologetically modern. It may have mauve walls, but it is otherwise all white. For those who may be concerned about mixing up different styles within the one home, this is a very good example of how a good solid white base can be used to unify even the most disparate elements. It's important to note that the almost retro glass light fittings are another important unifying element within the home. 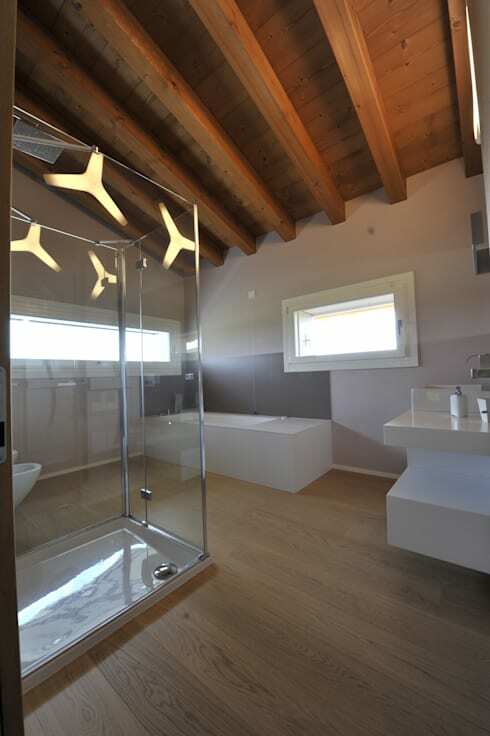 The bathroom is another room that really benefits from a modern style in this kind of home. However, the soaring wooden ceilings add an impressive rustic spirit to the room. The rich variation in the tones of the wood and chunky exposed beams add a huge amount of warmth to the space. They act as a good counterbalance to the relative cool of the glass shower and modern bathroom furnishings. When it comes time to relax in the wine cellar, it's clearly time to indulge in a more romantic rustic decor. 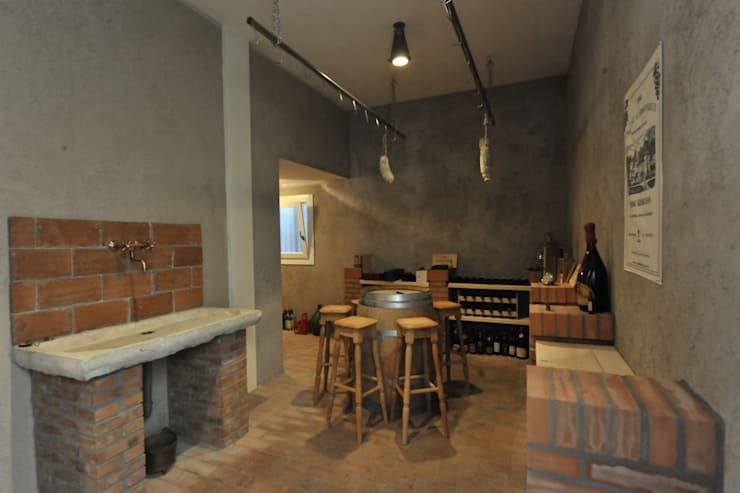 We also love the roughened concrete walls and the brick floor. Note the wine barrel table, old wooden stools and profusion of exposed brick on show. Wine cellars are obviously much darker and the darkened walls add a more cosy, old-world ambience to the room. We present just one last glimpse of the exterior of the home. Check out those columns. Here one has been used to create a great outdoor grill or barbecue. Outdoor areas often look cluttered up with unattractive barbecue accessories. But here we have the perfect integrated approach. It doesn't clutter up the walkway either. For more country style architecture, have a look at The timber home you won't forget. What do you think of the unique features in this rustic home?